Change can be both a beautiful and scary thing at the same time. This is especially true when line-ups change within a band… but 9 times out of 10, it’s always for the better. 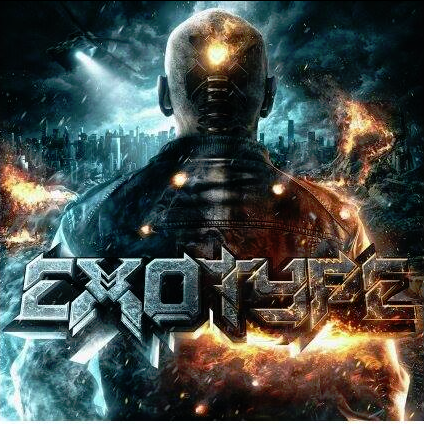 This can especially be said for FL’s Exotype who just released their debut full-length via Rise Records. If you’ll recall, just a mere 2 years ago… New Transcendence had the pleasure of exclusively introducing the world to this machine via their debut EP, Emerge. At the time, the band was fronted by Catalepsy’s Josh Anderson and it brought a truly destructive, monstrosity of sound out in the band. However, when Anderson left the band and was replaced by Steven McCorry, the core of that sound remained but there was a beautiful transformation that was unforeseen. Being that Steven is more influenced by modern metal and 90s nu-metal, the sound is far different than what your ears may remember. For those unaware, the band’s signature sound was a mix of death metal and dubstep. I know what you’re thinking… “Why would you want to mix the two? !” Well… true death metal fans should take a listen to Emerge and find out for themselves. Now, the band has taken a more mainstream turn which, usually, would amount to people calling a band “sellouts” or saying they’ve “lost it”. Sitting high atop the Billboard Heatseekers charts at #27 in it’s first week isn’t a bad way to go, though! The first single, “Wide Awake” proves that change is a great thing! “Wide Awake”, which features well-known metal vocalist Chad Ruhlig, is a track about how society is waking up to the wrongdoings of the “powers that be”. It’s a track that operates on the principal of “United We Stand, Divided We Fall”. “What is this? I am beyond your commands? My terminal is now aware, F-Disk this f**king world!” For any of you who reading this who are not nerds, an “f-disk” process is the process of formatting or re-partitioning a hard drive. It’s a way of saying we will rise above and find a way to get things back to normal… this governmental tyranny can no longer be tolerated! The song “Relentless” which features a very rare cameo appearance from Born of Osiris’ Ronnie Canizaro is very much up for interpretation. The 3 main ideas I get out of it are these: Either it’s about someone stealing your identity and using it to destroy your life, split personalities (and you’ve got a Dr. Jekkyl/Mr. Hyde type thing going on) or, from a technological standpoint… literally having your mind hacked and being forced to say and do things that ruin other people’s lives. Whatever the case, this mid-tempo beast is sure to appeal to you in one form or another. There’s a couple more songs that I want to talk about. The first is “For Those Afraid to Speak” which features one of 3 DJs on the album (DJ Rekoil). This song is pretty self-explanatory by the title alone. It’s a song about standing up for those who are afraid to speak their mind, being the light in the dark for those who are afraid to defend themselves and rising up against the tyranny. “If you’re feeling ashamed and you’re living in pain, just believe in yourself and you can conquer the sting. It’s the way of the brave, it’s the way you behave, get a grip on yourself before it drives you insane”. It’s also about not letting your past define you, always looking to the future and never being afraid to stand up and speak loud about your beliefs. This is one of my personal favorites from the album and has been since the first time I heard it. You’ll lose all control when you hear McCorry growl “You think that you own me?! I think that you owe me… BACK THE F**K UP!”… this is surely a mosh-starter live. The final track I want to talk about is the one that started it all for them and Rise Records… “Nanovirus”. This track is about watching your enemies sink back and poison themselves from guilt, shame and insecurity from the things they’ve done. “You’ll regret this…” is all too common a theme when it comes to betrayal. 9 times out of 10, it’s true… at some point in life, that person or group, typically, DOES regret it. This track is one of the closest to that metal/dubstep sound that the band pioneered, while introducing that brand new vibe that was brought forth with the line-up changes. We at New Transcendence have had the honor of watching these guys grow and are INCREDIBLY proud of how far they’ve come… but it’s far from over! Steve McCorry, Gabriel Montalvo, Rob Walden, Matt Browning and Spencer Franke (AKA Exotype) are a fine-tuned, destructive machine and they won’t stop until the world heeds their warning and rises with them to stop this insanity we’re being put through daily… before the fall of man is upon us. 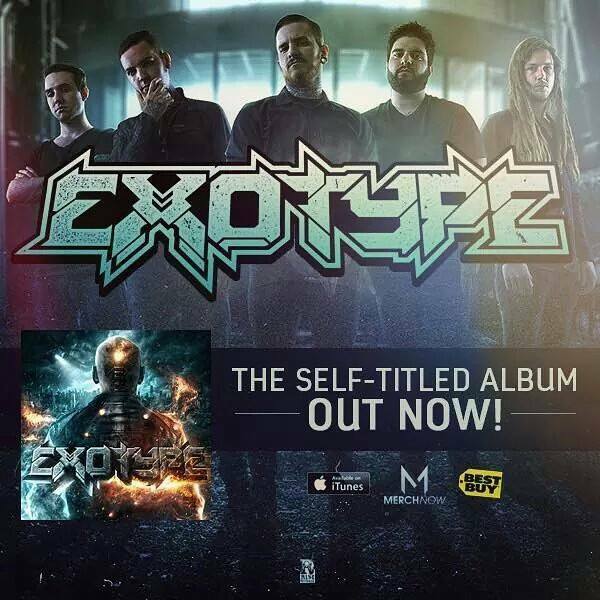 Be sure to support ALL the Rise Records bands but pick up your copy of Exotype from the guys on tour or by visiting the links below! You’ll be glad you did!